"A perceptive and alarmingly modern insight into the devastating power of perverted love and twisted logic. A fabulous story, and powerful theatre. " This production aroused tremendous excitement on a tour of arts centres and colleges in England. It took Canada by storm, chosen as best production at each of the three festivals it played. 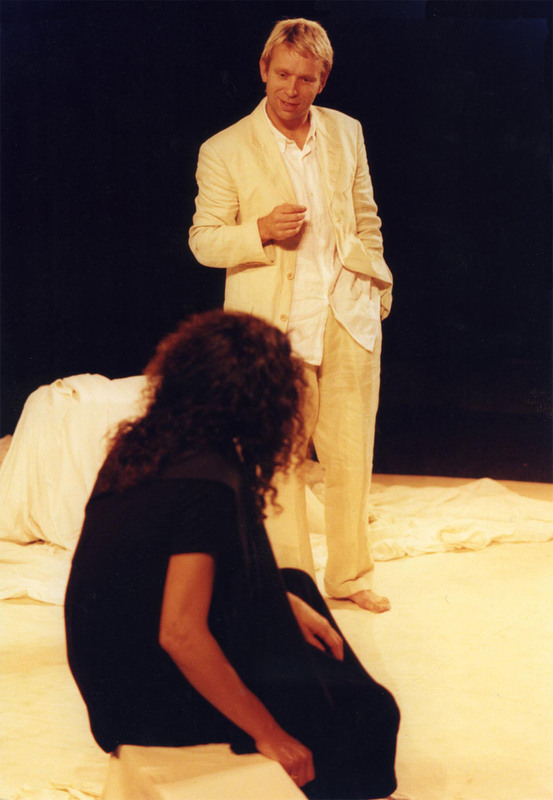 After performances at the 1999 RSC Visitors Season, Medea played the Orlando International Fringe Theatre Festival, winning awards for Best Production and Best Female Performer. Medea has proved to be of particular interest to colleges and Open University groups. 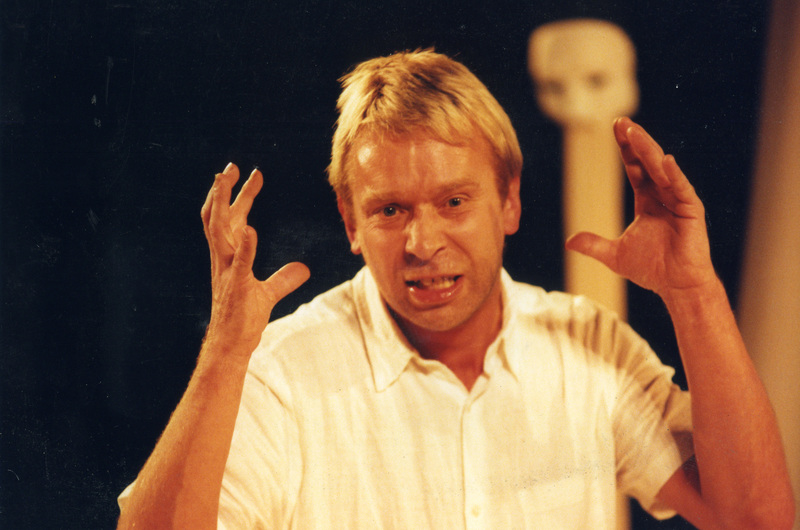 An accompanying workshop explores the themes and the structure of Euripides' original, relating these to present day concerns and styles of theatre. Jason's body, wrapped in cloth, is conjured out of the sea by Medea. Their sons demand to be told again why Jason deserted them and why their mother killed them. So Jason and Medea begin to recount the story. The nurse is the first character to be presented. She reminds the children of what happened before the fateful day. How Medea helped Jason and the Argonauts win the Golden Fleece. How Medea fell in love with Jason and fled with him first to Iolchis - where she was responsible for killing the king - and then to Corinth. And how Jason and Medea lived in exile in Corinth and raised their two sons. But now Jason has announced that he is to marry the daughter of Kreon, King of Corinth, and Medea is devastated. Medea can be heard howling inside the house. The Nurse is clear that Jason is in the wrong. She feels sympathy for Medea, though the ferocity of her mistress' temper frightens her. The Tutor joins her, bring the boys back home. Nurse and Tutor condemn Jason's selfishness as Medea is heard lamenting inside the house. The Nurse tells the Tutor to keep the children away from their mother. The Women of Corinth arrive to find out what's happening. When Medea appears, her fury is thoroughly controlled. She persuades the women to support her attempts to revenge herself on Jason. Kreon the King appears. Only he seems to be truly aware of the danger that Medea poses. He announces that he intends to banish her and the children immediately. But in the face of her pleas he allows her to stay one more day. When Kreon has gone Medea reveals her initial plan of action - looking for the opportunity to kill Jason and his new bride. When Jason arrives he tries to persuade Medea that his marriage will be for the benefit of them all - that she and the children will thrive through this alliance with the royal family. But Medea is thoroughly unpersuaded and refuses his offers of help. Medea needs somewhere to escape to after the planned murder. Suddenly Aigeus, King of Athens, arrives having just visited the oracle of Apollo to ask for help in producing a son. Medea promises to help him overcome this problem if he will offer her refuge. He agrees, provided that she find her own way to Athens so as not to compromise him. After Aigeus' departure, Medea reveals to the Women of Corinth that her plan includes the murder of her two sons. The women beg her to reconsider. Jason returns and Medea fools him into believing that she now agrees with what he has done. She persuades Jason to encourage his new bride to accept the gift of a golden robe and coronet that her boys will carry. The robe and coronet are impregnated with a deadly poison. The Tutor arrives to confirm that the gift has been delivered and can't understand why Medea is not happy at the news. He delivers the boys back to Medea's care. The Messenger bursts onto the scene with news of the deaths of Kreon and his daughter. He describes in detail the horror caused by the poisoned gifts. Medea agonises about what she is to do but finally enters the house to murder he sons - knowing that other hands would otherwise kill them for bearing the gifts. The women listen to the screams of the children, having sworn an oath not to intervene. Jason returns to discover what has happened and batters at the door of the house. Medea appears in a winged chariot with the bodies of the boys and lays out a justification for her actions. Jason knows his life has lost all meaning. Medea refuses to allow Jason to touch the bodies of his dead sons. Jason slips back into the sea from where Medea had conjured him. As Medea settles once again on the rocks the voices of the boys make it clear that still don't understand why the killing had to happen. The easy winner as the best play at this year's Fringe is Medea. Medea is magnificent, there's no other word for it. In this play of a crime against nature and its provocations, Bill Buffery and Gill Nathanson pull out all the stops. Nathanson's Medea is calculating and passionate all at the same time, and even when she addresses the women of Corinth, she has all the style of a great trial lawyer. She also has "violence in her soul" and it leads her to a place where few women have gone: she murders her children. It seems impossible in the saying and while Nathanson makes it understandable, not even her formidable acting skills can make it acceptable. Buffery, too, puts in an astonishing performance as he attempts to rationalise his abandonment of Medea and his two children. He oozes that combination of sleaze and self-satisfaction that we have come to expect in politicians, from Bill Clinton to Tony Blair. One other thing. Medea isn't just written with the precision of a scalpel and acted with exquisite detail and emotion, it is also one of the most beautifully designed plays I've seen in a decade of fringe reviewing. From the opening tableau, with Medea perched on a promontory like a dark thought contemplating its own existence, and with Jason rolled up in a cocoon of white fabric, through the use of shadows projected on a white background, to the wash of red lighting that announces Medea's unspeakable crime, this play finds the look that blends perfectly with the language and action. Did I say unspeakable crime? The triumph of this production is precisely that it articulates our deepest fears and gives voice to that part of the human soul that we want buried forever. Do anything you can to see this play. Medea lives in a hell beyond comprehension. Stranded in a white limbo, again and again she must answer the question of the children she murdered. "Why did you kill us mother? We don't understand. Tell us again," they weep from beyond the grave. And Medea, the outland sorceress who murdered the innocents, must again try and explain to their unquiet spirits why she committed this most hideous of crimes. Medea's story is the most terrible of the Greek myths. When Jason comes to her home in Colchis looking for the Golden Fleece, she falls so passionately in love with him she assists the hero in recovering the Fleece, even to the extent of killing her half-brother. After a series of blood-drenched adventures, she lives with Jason in Corinth. After 10 years, Jason decides to ditch Medea for a younger woman - the daughter of the King. "I have no-one. I am no-one," she wails to the women of Corinth. Alone and abandoned, she goes mad and attacks Jason where he is most vulnerable - his lineage. She kills his two beloved children. Multi Story shortens, contemporises and sets the work in a pure, white world made of sails, sheets and shawls. 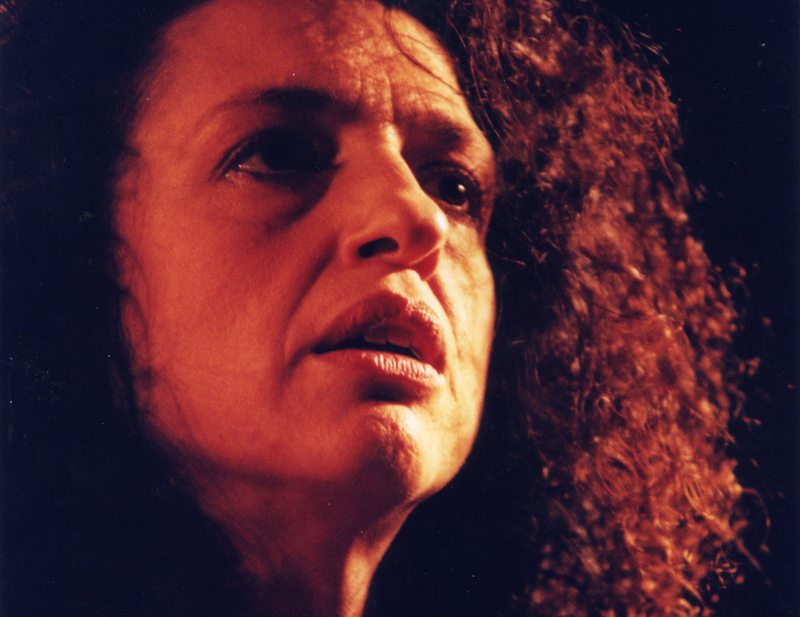 Medea (Gill Nathanson) dressed in black, unfolds out of the whiteness like a malevolent crow. Stunning. The innocent faces of her children shine from the whiteness. Nathanson's Medea ranges from coy seductress to raging madwoman, from driven angel of death to anguished mother who must face the horror of what she has done. Compassion, hatred, intelligence and madness wash across her face like waves on a Greek Isle. It's a stunning performance. Bill Buffery is her equal in a series of roles ranging from the women of Corinth to Jason himself - who tries to persuade Medea he's only doing it for the future of their children. This is classic Greek tragedy and requires the classic approach if we are to experience catharsis, the draining of all emotion that supposedly comes after a blood and thunder tale. Well, this is the tale and this is the company to tell it. The two performers are obviously trained - you can hear every nuance in the words as they are spoken with clarity and intelligence. Yet this is not an actorly exercise. Raw emotions rage through the production. You will be involved, carried along and profoundly affected. I sat in the beer tent and stared into the middle distance for some time afterward.